• Updated the .NET DLL and Crystal UFL to support GS1-QRCode. • Added Crystal Reports and VBA Native Font Encoders to the package to allow barcode generation without UFLs or DLLs. 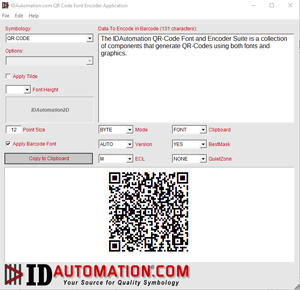 • Added a new Font Encoder Object to create barcodes in Filemaker that is compatible with FileMaker Pro, Pro Advanced and Go. • Updated the Font Encoder App (FEA) to generate EPS images. • Added more efficient barcode generation algorithms to all updated components.